4 mounted figures, 8 standing. comes with a selection of changeable heads. could also be used as cowboys/early pioneers. 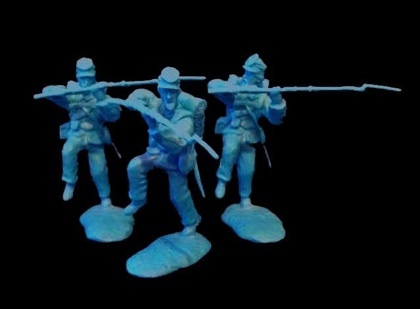 Alamo Defenders Set 1 – £25.00. 16 figures. Scaled to fit with TSSD and Conte. 12 figures in blue or grey. American Civil War, set #1. £25.00 12 figures in blue or grey. Interchangeable heads, comes with both kepi and campaign hats. Mounted Apaches, £25.00 a set of 6 on TSSD Indian horses.